Delta’s pressure sensor has many different pressure ranges from -100kPa ~ 100kPa and -100kPa ~1,000kPa. Users can obtain pressure change signals with pressure sensors they develop. The 2 output signals and 1 analog output signal inform the host controller to conduct relevant control, allowing different systems to reach a stable control status in a short time. Delta’s Standard Multifunction Pressure Sensor DPA Series is able to detect positive and negative pressure. The large LED has 3-color display that allows users to set up colors according to actual demand. Various output control modes are available, such as NPN, PNP, analog voltage and current. 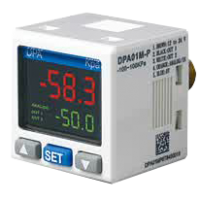 The fast parameter copy function makes it easy to copy parameters to other DPA pressure sensors, saving on time spent setting up the same parameter over and over again. The safety control mode prevents onsite staff from setting parameters that affect the operation of the equipment and production line.